Our lives are filled with events: some happy, some sad, some common enough, while others are extraordinary. Those events shape us and define who we are, but are also what we leave to our families as memories. I’m sure you have those events and memories in your mind. But if they are only in your mind, and not passed on, that is precisely the risk. Once we are no longer around, who will remember them? This is one of the most common concerns of genealogists and family historians. We must secure a way to not only retain these memories but to transmit them to future generations. One way is to remember our ancestors on a particular date, even though most of us remember our nearest and dearest on a daily basis. Some people say prayers, others light candles or look at photos. The key is to continue talking to your ancestors that are still living at every opportunity. My good friend Carol Hoffman is a retired librarian, strongly involved in genealogy, on the database team of The Israel Genealogy Research Association (IGRA), and the president of LitvakSIG. Carol has a special way of remembering her parents. She wrote to me about it the other day and I found her words so captivating that I asked her permission to share them on our blog. “This year Grandpa’s yizkor falls on Christmas. We light the yizkor candle the night before, on 24 December 2016. It will be 48 years that he has not been with us. Many of you might have been too young to remember him, but what I ask of each of you every year is to take some time aside that day and recall whatever you can of his memory. My memories are endless, but I always think of him as kind, soft-spoken – a man of few words, highly intelligent, and always a gentle gentleman. This year I bring the message to you early because, just a few minutes ago, I found a wonderful piece of evidence of Grandpa’s signature. 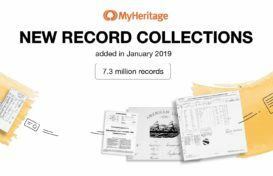 I read the announcement that MyHeritage added U.S. World War I Draft Registrations, 1917–1918—more than 24 million records—to their collection. 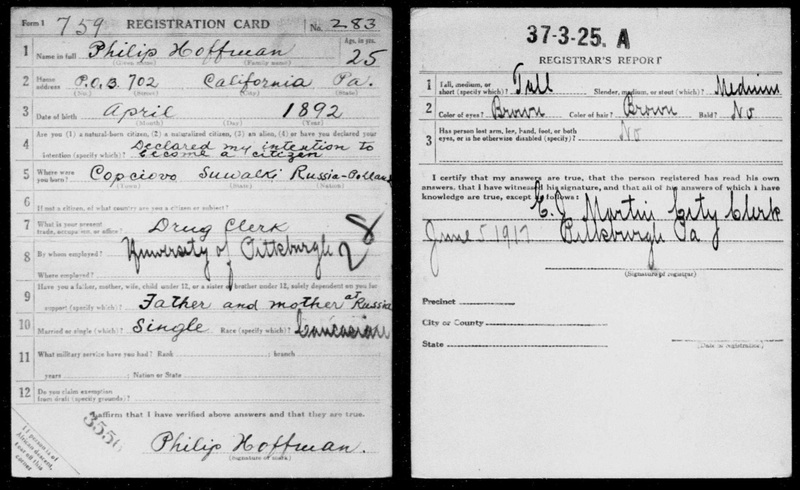 Philip Hoffman’s United States World War I Draft Registration June 5, 1917. It shows he was born in April 1892 (yes, we knew that) in Copciowo (Kopcheve, Yiddish; Kapciamiestis, Lithuanian) in Russia then and now in Lithuania. 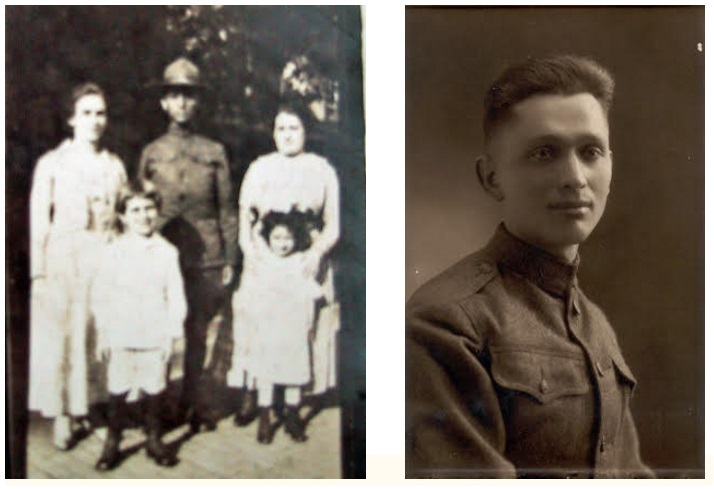 Note that he was a drug clerk employed by the University of Pittsburgh [Grandpa graduated University of Pittsburgh School of Pharmacy following his 1919 discharge from the army]. He was single, and living in Little California, PA. Look at the bottom of the first page, and you’ll see Grandpa’s signature – exactly as he wrote it his entire life in the US. And, as an extra bonus, Grandpa Philip with the family and his portrait in uniform. You can laugh because, when I was a little girl, I thought he was a general because he looked so important in his uniform (he was a Private) ! Yizkor: 24 December 2016 light a yizkor candle for Grandpa Philip. I’m sure you also have numerous ways to remember your loved ones, who are no longer with us, daily or on special occasions. Please share with us some of your ideas; perhaps it will help others find new ways to remember their ancestors.